luxamundi: Bioderma Hydrabio Riche: the one to fire me up about moisturisers? 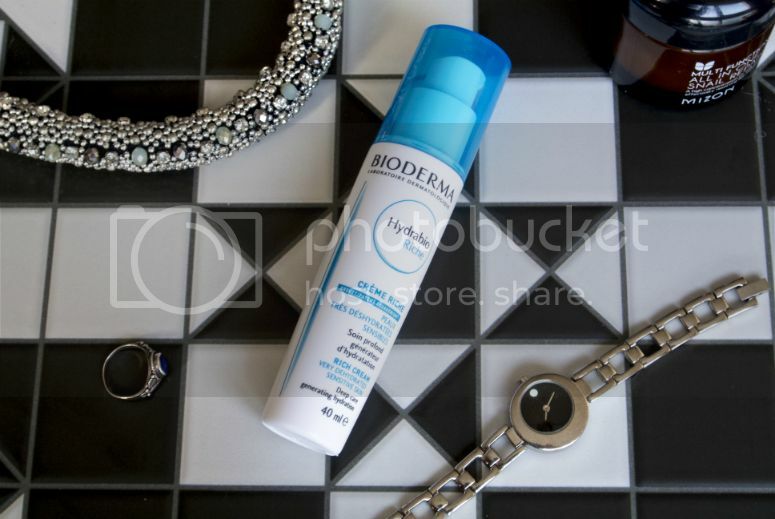 Bioderma Hydrabio Riche: the one to fire me up about moisturisers? I'm a moisturiser floozie. For someone who is obsessed with hydrating their skin, I'm not actually that fussed about moisturiser as a product. Yes I will always use it, but I never find myself fired up over it. You'll find me cooing over masks, treatments and serums, but quite 'meh' about moisturisers. I do always finish off with one before I apply my makeup, to try and seal all the other products in, and to create a little bit of a barrier between my skincare and my makeup, but only because I feel like I ought to, not that I want to. Since I always tend to get GWPs or extra large samples of moisturisers with things, I haven't actually gone out to buy one in a long time, I just work my way through samples that I don't really care about, then toss them away to try samples of something else, hoping I'll find one that makes me want to buy a full size. Truth be told though, I've been getting a bit bored with this approach, so decided to knuckle down and get on with looking for one. A 3 for 2 offer in Boots on skincare, as well as the fact that they had just landed in store, meant that one dreary afternoon after chatting to a sales assistant, I walked away with the Bioderma Hydrabio Riche, in the hopes that it would make me interested in moisturiser again, as well as deal with the dehydration I constantly battle. I had high hopes here, after all there are several key phrases on the bottle: 'hydra', and 'very hydrated sensitive skin', and 'deep care generating hydration'. It's also colour coded blue. Yes I know, seems trivial, but in my mind, I link blue with water, so makes sense with this range to colour code it blue. It comes in a very easy to use pump system (and a good solid one at that), which is my favourite, because it's hygienic, can dispense exactly the right amount for your needs. It also comes mostly unscented, and in a way that is hardly detectable or noticeable, which is perfect for anyone who doesn't like fragrance in their skincare, or gets irritated by it. Perhaps it was because I picked up the 'Rich Cream' version, but I don't feel myself loving this moisturiser when I put it on. It feels like the emollients I used to have to pick up on prescription and would have to smother myself in. Yes, all moisturisers are technically emollients, but applying this to my face makes me see that word in my head. It feels so industrial. I also don't feel like it's really making all that much difference in the hydration department on its own, but I guess I've not been using it long enough to really see dramatic improvement. It definitely forms a very solid layer between the rest of my skincare and any makeup I put on afterwards, to the point my skin feels heavy. This all sounds like I'm going to end on a down note, but I'm hopeful that as the weather gets steadily colder, and my skin will want more comfort, this moisturiser may well come into its own. If not, I'm willing to give the other moisturiser in the Hydrabio range a go once this is finished, as well as the serum, but then again, I might be tempted by something else instead. Clearly, if you put your moisturiser in blue packaging, and slap on the word 'hydra' somewhere, you'll have my attention.